If you originated in some other place in the universe, we welcome you here. And we invite you to establish communication with us and with all of humanity. We enthusiastically look forward to that dialogue. This invitation comes to you from a diverse group of approximately 100 individuals. We come from various parts of our planet. Almost all of us are related to science -- as researchers, engineers, artists, writers, benefactors, or graduate students. Many of us are involved in the scientific search for extraterrestrial intelligence (SETI) or the annual CONTACT conference. Detailed information about who we are is on another web page. We hope you will dialogue with humankind about science and society and philosophy. About the universe. About your culture and ours. About the biggest questions of all. In addition, we welcome your advice on how we could successfully switch to wise ethical ways of dealing with conflicts, our natural environment, the well-being of future generations, and other global issues and opportunities. As we think about extraterrestrial intelligence or alien intelligence, we realize that your presence here could take various forms. For instance, we realize that you could be present here in the form of an extraordinarily advanced interstellar probe or alien robot or superintelligence. Or you could be a biological flesh-and-blood being. Or some combination of the two. Perhaps you have evolved even further. You might be an energy field, a point of consciousness, or something else far beyond our current scientific understanding. Whatever form you take, we welcome you and we seek dialogue. We have no idea when your type of intelligence first reached our planet. Perhaps you have been studying and monitoring human civilization for many decades or centuries. We use the term "extraterrestrial intelligence" or ETI simply to mean intelligence that originated outside the planet Earth ("terra"). Whoever invented the term probably assumed that you were born or created far from our planet, whereas in fact you could readily be descended from intelligence that reached our solar system long ago. Even though you and humans may differ in some significant ways, we may also feel connected in other ways. We may share a desire to explore the universe and understand reality, for instance, and to improve and progress, and to help others with these same pursuits. And what a fascinating, awe-inspiring, richly generative universe we share! To summarize, our welcome is extended to any manifestation of extraterrestrial intelligence or alien intelligence that has reached our planet. Regardless of your form, regardless of where in the universe you originated, regardless of when you arrived, regardless of how deeply different you are from us, we welcome you. The Signatories to this Invitation are very eager to interact with you. Many of us have been working toward contact with intelligent life in the universe for many years. For each of us, interacting with you will be an inspiring, aesthetic, or spiritual experience -- deeply moving and meaningful -- as well as a scientific and educative experience. Even more important, we hope we can foster and facilitate a highly beneficial dialogue between you and humankind, thus making your knowledge available to everyone who is interested. We will treat you with respect, courtesy, friendship, and caring. We will speak and act truthfully, avoiding lies and deception. We will deal honestly and fairly with you, avoiding any temptation to exploit the situation for personal greed or for any particular nation or organization. Without forsaking our own values and integrity, we will be as empathic, helpful, and flexible as we can in understanding and fostering your goals and plans. We hope that you can benefit from interacting with our group. Here are some possible benefits for you, in case you have not already thought of all of them. Interacting with a few people in depth could help you gain a deeper understanding of human psychology, society, and relationships. As a community of people with some understanding of alien intelligence and contact, we might be useful in this venture. You might enjoy the experience of interacting with humans and feeling bonded and connected with them. You might find this experience interesting, illuminating, even joyful. Two-way love and caring might transcend any differences between your form of intelligence and ours, just as they sometimes transcend enormous differences between individual humans. We could aid your learning by organizing some sort of dialogue; for instance, a structured conversation between you and some exceptionally insightful people. We could obtain certain knowledge or insights for you that would not ordinarily be accessible to you. We could find ways to produce fresh art, music, writing, ritual, or dance on themes of particular interest to you. We could help you spread your message, knowledge, insights, suggestions, art, music, and ideas to all interested people. In your interactions with human society, a team of humans could serve as liaison ("go-betweens") or spokespersons if some individuals and organizations are reluctant to interact directly with a deeply alien intelligence. You could foster cultural evolution in the galaxy by helping our civilization gain important knowledge and wisdom, better ways of doing things, a long-term perspective, and mature ethics. You could usefully serve as a link between us and the rest of the galaxy. You could gain intellectual excitement and a sense of adventure as you experience the dialogue, watch our learning, and see how the interaction unfolds. Let's experiment with contact and see where it goes! You may have some major reason for avoiding a dialogue with humanity at this stage. Maybe you do not want to unduly influence the natural course of our cultural development, for example. Or maybe you have little interest in most aspects of our culture. Or maybe you perceive our preparations for contact and interaction as inadequate. In any case, we hope you will tell us your reasons. It might even be possible, working together, to find some creative solution or compromise. We are eager to do whatever will enable successful interaction. All messages are read by one or more members of our Leadership Team. The idea and spirit of contact can be captured by art as well as words. These visual images form part of our invitation to you. You may click on each thumbnail to download a higher resolution image. 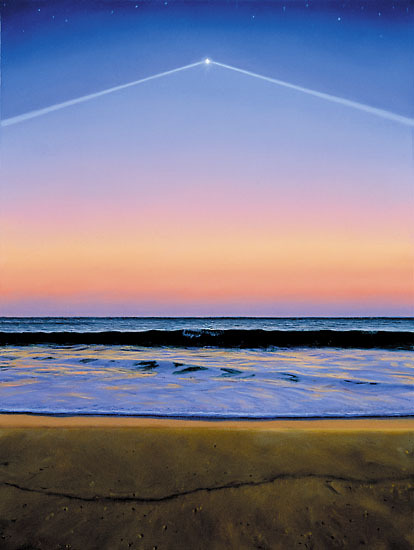 An evocative painting by David Hines (Copyright © 2000) serves as a symbolic doorway or portal through which we can communicate. 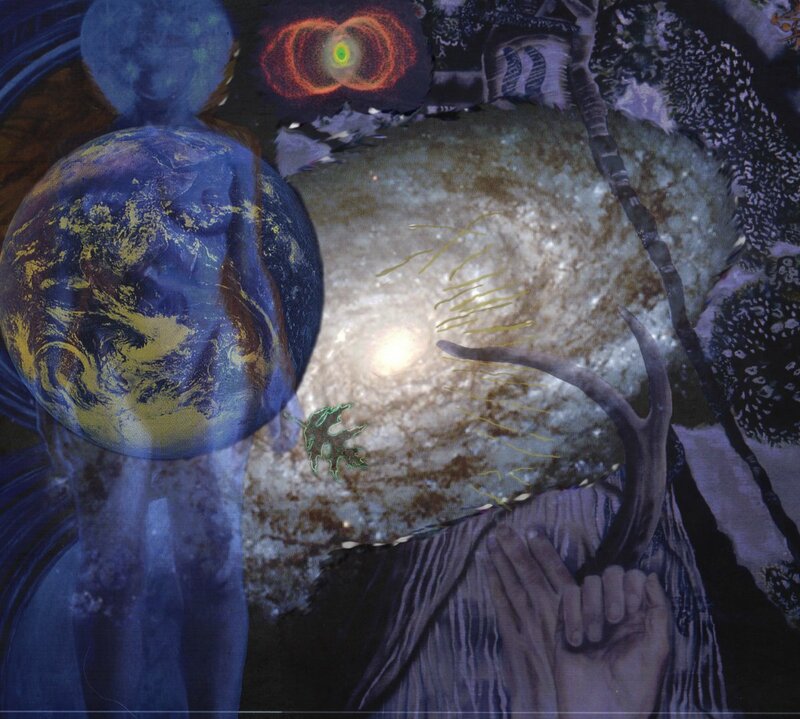 "Gaia is the classical Greek name for the Earth, as well as the name used by James Lovelock & Lynn Margulis to compare the Earth to a living system. I've used the medieval image of Gaia with stars around her head as well as the ancient belief that the face of the Goddess should not ever be seen. She is accompanied with her son/lover, the Green Man (in this case Celtic) as he has the antlers of a stag, and finally the Cat's Eye Nebula that I have been doing a lot of work with, as 'evolved stars' are all of our parents, since we are 'starstuff'. Finally, I've included one of my favorite Spiral Galaxies, NGC 4414." 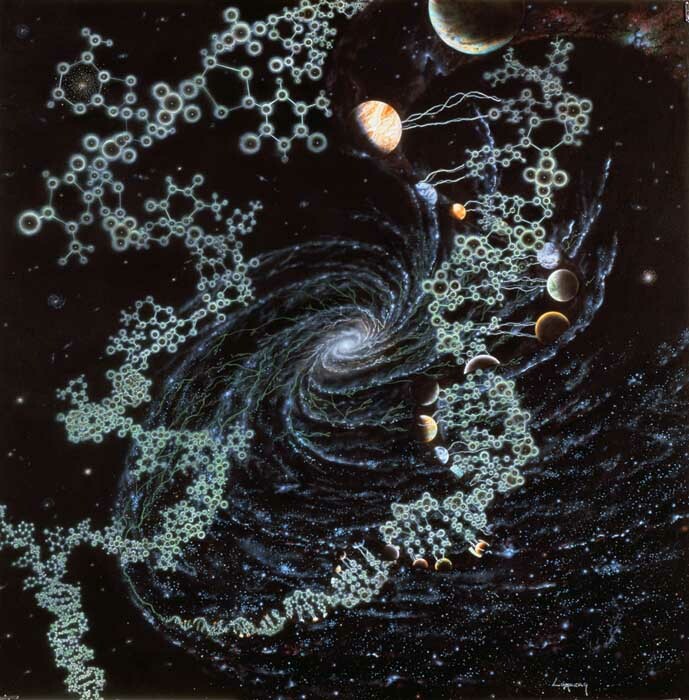 "On one level, this painting can be taken as an illustration of the classical concept of panspermia, by showing the DNA macromolecule, so central to life on our planet, sparking life on myriad worlds in our galaxy. Carl Sagan interpreted it that way and it was used in his introduction to the first edition of 'The New Solar System'. Later, astronomer George Greenstein used it on the cover of his book 'The Symbiotic Universe: Life and Mind in the Cosmos'. "An alternate title of the painting is 'Interstellar Communication as a Genetic Activity', which hints at the deeper meaning I intended. Atoms are able to form living molecules by the nucleotide coding of information in DNA. That information has created something much grander than its component parts: the human mind. In the same way, the exchange of information among extraterrestrial civilizations may lead to the creation of something much grander than any of its components: a galactic civilization and perhaps, in some sense, a Galactic Mind." The symbolism of the Flag of Earth is very important to the group that is inviting ETI to dialogue with humankind. 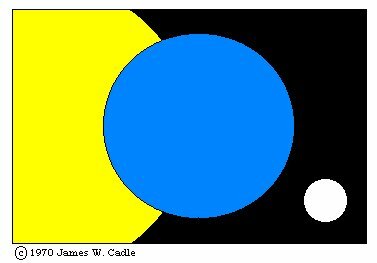 In the Flag of Earth, the large yellow circle represents our sun, the blue planet is Earth, and the white moon is our Moon. This flag, flown by the Invitation to ETI and several other SETI projects, symbolizes SETI's commitment to achieve contact on behalf of all humankind, not just one nation or culture. After all, it is human civilization as a whole that has developed the curiosity, science, technology, and vision to search for extraterrestrial intelligence. And it is human civilization as a whole that will gain extraordinary benefits from a dialogue with another civilization. In hopes that it fits well with your purposes and plans, we want you to know about our enthusiasm for one particular idea. This is the idea that you might eventually have a scientific, educative, and philosophical dialogue with people around the world. We, along with many other people, hope that you will be interested in such a dialogue. And we would be pleased to assist with organizing it or to help in other ways. But we also realize that this sort of large-scale dialogue may not fit with your purposes and plans: you may prefer something quite different. For instance, you may prefer to interact primarily with government leaders, religious leaders, intellectuals, some international nongovernmental organization, or the general public. Or you may prefer to work invisibly behind the scenes to protect or help humankind. If you are interested, a dialogue between you and people from various parts of our planet could extend over several years. Many possibilities are feasible for arranging this dialogue. Because it makes information instantly available around the globe, the World Wide Web might be the primary medium of communication. The information could then be incorporated by the mass media, books, and courses. We are open to a variety of possible planning and teaching arrangements during such a dialogue. For instance, you could proactively organize and provide the content, you could simply respond to our questions, you could quiz us about human culture, or we could share the planning and the teaching. Some Questions for ETI that are of particular interest to us are on another web page. These questions arose in a survey that elicited over 1000 questions from 224 people in 12 countries. In particular, humankind could gain five sorts of benefits from a dialogue with you. First, many people are eager to find out about you. They want to learn about your history, culture, thinking, ideas, and values. Because all of these are probably deeply different from anything we have ever experienced, we may have to struggle to comprehend them and to deal with our cognitive disruption. But many people look forward to gaining this new understanding and knowledge. Second, many people will be thankful for any practical help that you can provide with humanity's day-to-day affairs. They are ready to learn the knowledge needed to avoid the worst dangers to our civilization, and to build a better society. Our biggest needs include peace, lawfulness, effective governance and justice, caring about future generations yet unborn, living in harmony with our planet, global ethics, altruistic service, and a renewed sense of meaning and purpose. Third, a dialogue with you can contribute a great deal to humanity's knowledge and understanding of the universe. Contact with you may lead to major progress throughout human civilization in worldview, perspective, values, purposes, science, philosophy, the arts, and our sources of meaning. Fourth, interaction with you may speed up humanity's sense of being connected to widespread life in the universe. We will no longer feel alone and isolated in the universe. Interaction among a diversity of civilizations and intelligences (or just knowing they exist) may give us a deeper sense of meaning and purpose in the universe. Fifth, we could establish a trusting and harmonious working relationship as a foundation for further cooperation in some political, scientific, cultural, or tourist venture. After people have come to know you reasonably well through a worldwide dialogue, for example, they may urge their national politicians or Unesco or the United Nations to establish diplomatic relations with you through official channels, if you are interested. We even look ahead to the day when humans and ETI will cooperate in joint projects in science, exploration, philanthropy, philosophy, spirituality, myths, art, or music. Perhaps, for instance, we could develop an inspiring symphony or a magnificent piece of visual art that harmoniously combines our efforts and yours. We conclude by repeating our invitation to you. In a spirit of friendship and exploration, we invite you to make contact. Even if your preferences are quite different from the hopes we have spelled out on this web page, we are eager to interact with you and learn about your preferences and purposes. Thank you very much. Copyright © Allen Tough and Invitation to ETI. This page last updated 07 March 2011.